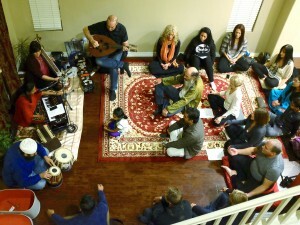 Grateful to Center for Spiritual living Simi Valley for sharing their beautiful sacred space and having us play Kirtans there! 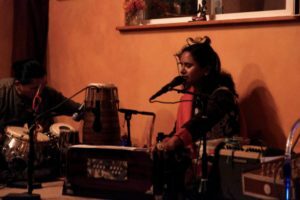 Hare Krishna Hare Rama in traditional style of call and response Kirtan with Kamini Natarajan leading the group at Jyoti Mandir Encinitas. 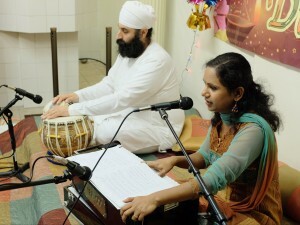 Sri Ram Jai Ram Kirtan with Kamini. Chanting and singing names of Sri Ram at Jyoti Mandir Encinitas, CA. 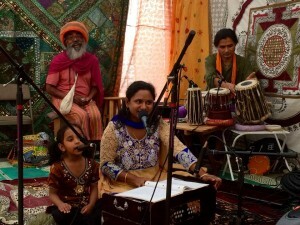 Singing with Kamini is little Shivali- her daughter. 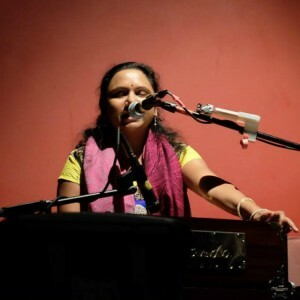 Traditional call and response style of singing for deep meditation. 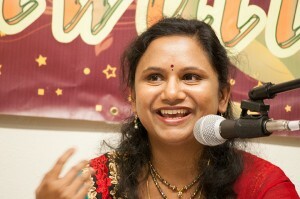 Kirtan with Kamini is a sacred world music event and a spiritual gathering. 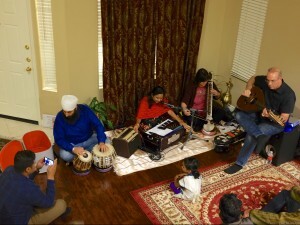 Kirtan and Bhajan singing, chanting, meditation with music from traditional heritage. 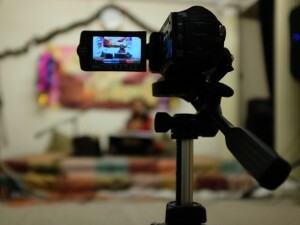 Live video from beautiful Jyoti Mandir in Encinitas, CA. 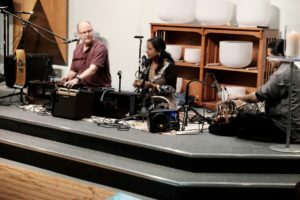 Accompanied by Dan Blanchard on Santoor and Manohar Gurung on Percussions. Here is a recording from my daily morning practice. This is a morning raga “Ahir Bhairav” very beautiful, calming and meditative. 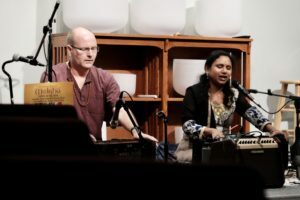 Chants for Meditation by Omneity: Music Producer Ken Elkinson and Kamini Natarajan. This chant is called Universal Joy. Fifth track of Chants for Meditation is from “Upanishads” Sarve Bhavantu Sukhinah is peace mantra. ॐ सर्वे भवन्तु सुखिनः सर्वे सन्तु निरामयाः । सर्वे भद्राणि पश्यन्तु मा कश्चिद्दुःखभाग्भवेत् । ॐ शान्तिः शान्तिः शान्तिः ॥ Om Sarve Bhavantu Sukhinah Sarve Santu Nir-Aamayaah | Sarve Bhadraanni Pashyantu Maa Kashcid-Duhkha-Bhaag-Bhavet | Om Shaantih Shaantih Shaantih || Meaning: Om, May All become Happy, May All be Free from Illness. May All See what is Auspicious, May No One Suffer Om Peace, Peace, Peace. 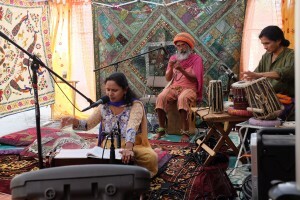 A live recording from Kirtan on August 23rd 2015. This is a Chant for Guru. 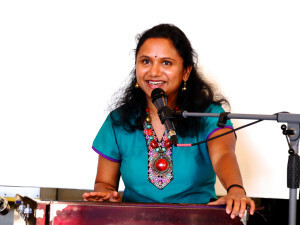 Kamini singing Raag Kedar at Kathmandu Boutique for its 10th Anniversary. 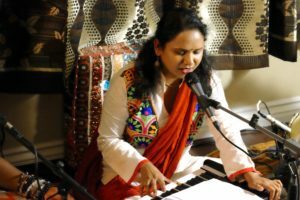 4 yr old Shivali Kamini Chandrashekar joins me to sing “Ganesha Sharanam” Kirtan at 10th Anniversary of Kathmandu Boutique on June 15th 2015. A BIG thanks to James ” Maha Krishan” for sound, Reena ji for organizing this event and Manohar Gaurang and Haribol for Percussions! An awesome gathering of awesome people!! A HUGE thanks to Reena Gauchan and everybody who contributed in organizing it. delicious Nepali- Indian vegetarian food, chai and special thanks for making this event ZERO waste!!! A Big thanks to all the wonderful musicians as well! 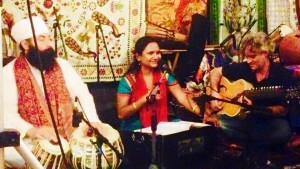 Thanks Dave Cipriani and Saheb Singh and Dahveed Haribol Das for playing with me. Here is video. Raga Puriya Dhanashree in 16 beat Teentaal. 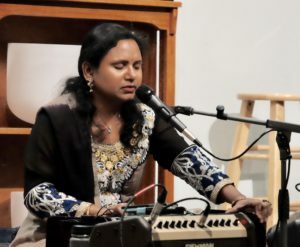 A live video from Kirtan with Kamini 1-25-2015 event. This one is for Goddess – Devi. 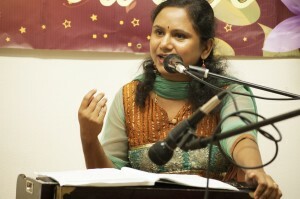 Here is a video from my most recent event- An Evening of Devotional music at Hindu Temple Ventura County. 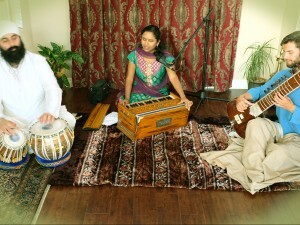 Thanks a lot dear friends at Hindu Temple for supporting and encouraging Music and Art at your Temple. It feels divine and I love to perform at your temple ! 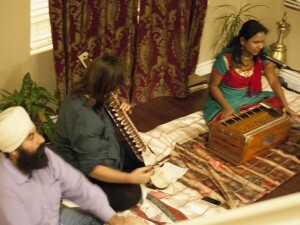 Singing and chanting the divine name of Goddess Saraswati – the Goddess of art, music and wisdom. The video was created to commemorate Mahatma Gandhi’s Birthday on October 2nd 2012 which is also the UN declared International Day of Nonviolence. Please share the video to spread the message of Nonviolence. 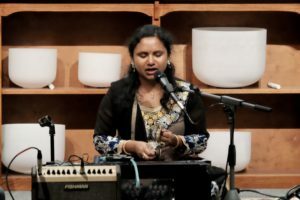 This is a recording from a live performance at Hindu Temple Ventura County, CA. Accompanying me on Tabla is Saheb Singh.